Thus begins the jacket cover description of this historical murder mystery by Lauren Belfer. 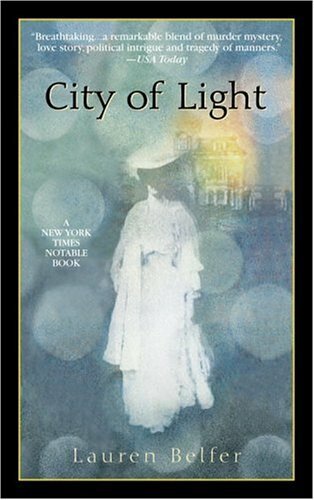 Published in 1999, City of Light is an engaging look at turn of the century Buffalo as the Pan-American exposition (which culminated with President McKinley’s assassination) approaches. The story centers on Louisa Barrett, headmistress at an all girls’ school, who is witness to the world of politicians and industrialists vying to bring a bright future to Buffalo. However, a murder tied to the new hydro power plant in Niagara threatens to unravel secrets long held by the upper echelons of Buffalo society. Louisa narrates the story giving readers immediate accessibly to the era. Though at times our heroine may frustrate readers who wish she’d rebel against the conventions of the times, her actions ultimately are more plausible. Even if they’re not what we would want her to do. As much as this is a mystery story, it is also a rich tapestry of an American city at the dawn of a new century, shaking off the dust of the Victorian era with its gaslit rooms and embracing the promise of our modern American industry. All levels of society are presented from high society to immigrants slums to African-Americans navigating limited opportunities. There are anarchists, industralists, politicians, reformers, and the civic-minded. For some, this may seem to weigh down the story, which is by no means a fast-paced read. Louisa, herself, is rather a passive character who is swept up by events and machinations of others. Yet she and the story held my interest. Now, appearances of famous personages, such as Presidents McKinley and Cleveland, are to be expected in historical fiction. I was, however, surprised to discover that several other characters were actual people important to Buffalo’s rich history. I found this mix of real and fictional characters made the story all the richer. Of particular note were Maria Love, a social crusader for immigrants; Mary Talbert, who later became a vice-president of the NAACP; and John J. Albright, a wealthy businessman and philanthropist. The Historical Note at the end of the novel helped distinguish these and other real “characters” from their fictional counterparts. I first came across this book in 2004 and read it early in 2005. In fact, this was a selection for my mystery book group. Recommended for those who like historical mysteries or historical fiction. For more about City of Light and author Lauren Belfer, click here.